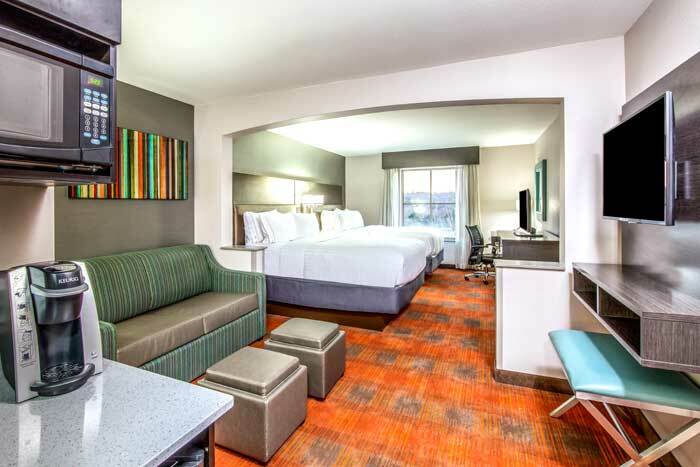 Welcome to the new Holiday Inn Express & Suites Shawnee - Kansas City West hotel. 24 Hour Fitness Center, Business Center, No Pets Allowed. 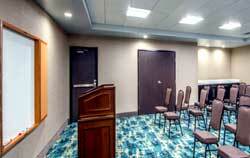 Up to 121 people with 1,800 square feet for your next meeting. 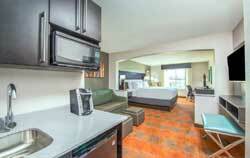 Separate Living Area and Mini Bar with sink Fridge and Microwave. We strive to provide our guests with a clean and comfortable room with friendly attentive service while you are away from home. 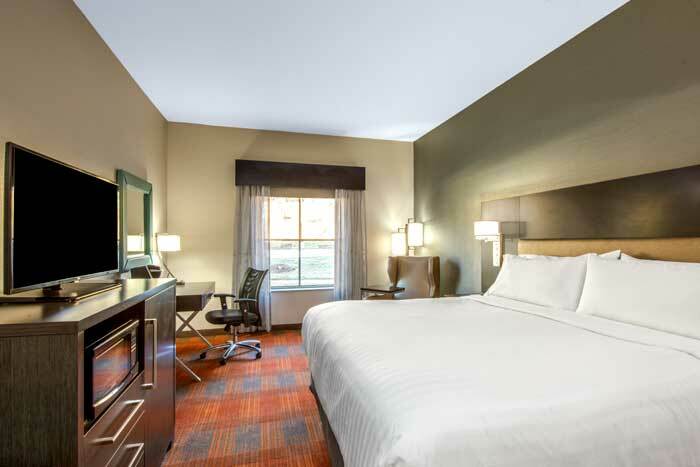 We are conveniently located off I 435 which allows travelers a gateway to any part of Kansas City within 30 minutes including the Kansas City International Airport (MCI) . Enjoy area attractions such as the Village West retail, dining & entertainment district, Kansas Speedway, Sporting Park and Schlitterbahn Water Park. Other attractions include the historic Country Club Plaza, Arrowhead Stadium, Kauffman Stadium Sprint Center, Power & Light District and the Kansas City Zoo . Be sure to try the local BBQ Kansas City is famous for! Whether your travels bring you here for business or pleasure our team is wholeheartedly committed to make your experience truly enjoyable. Our friendly staff is pleased to be of service and offer recommendations on restaurants, lounges, nightlife activities, and shopping. Start your day with our complimentary Express Start breakfast. Our many amenities include a heated indoor pool, 24-hour fitness center, meeting space, business center, free wireless and wired internet access. The hotel is also located near Bayer Corp, Biomune, Deluxe Check, FedEx, Grundfos, and Terracon. 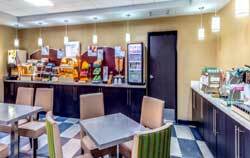 Our team is committed to making your stay an enjoyable one, welcome to the Holiday Inn Express & Suites Shawnee! Activities : The Parks and Recreation Department oversees more than 563 acres of city parks, Shawnee Town, the Civic Centre and the City's two state of the art aquatic facilities. 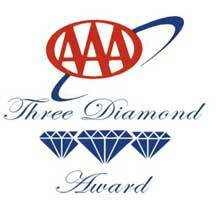 They also offer over 500 classes, programs and special events for youth, adults and seniors. Airport : The Kansas City Aviation Department owns and operates Kansas City International Airport and Charles B. Wheeler Downtown Airport. The Aviation Department's mission is to provide outstanding airport services in a safe and cost-effective manner for the benefit of citizens, visitors, airlines and customers. The department is an enterprise fund department of the City of Kansas City, Missouri, and is supported wholly by airport user charges. Attractions : Kansas City attractions offer an endless variety of things to see and do. Explore the only nationally-recognized museum dedicated to World War I. Let curiosity guide you at Union Station. Or, walk in the steps of America's 33rd President in Independence. Downtown : The Kauffman Center's overriding vision is to enrich the lives of everyone in the community through extraordinary and diverse performing arts experiences. The Kauffman Center, home to resident organizations as the Kansas City Ballet , Lyric Opera , Kansas City Symphony , and other innovative programming , embraces a variety of audiences with different tastes, interests and passions. Golf : Designed in 1934 by legendary architect A.W. Tillinghast, Swope Memorial Golf Course was once the home of the PGA Tour's Kansas City Open (1949), making it the only public course in the area to have hosted a PGA Tour event. Carved out of the wooded land in Swope Park, this tight layout, along with its undulated fairways and multi-tiered greens, provides a true test of golf; one that legends Ben Hogan and Sam Snead have been challenged by. Skyline views of downtown, accompanied by the roars of lions from the K.C. Zoo below, give this course character that is unmatched anywhere in the city. Come out and experience what people consider the best value in K.C.! Government : From the days of wagon trains pushing west to an entrepreneur pushing to open a new business. From settlers searching for their own land to college graduates looking to land a first job. People have always looked for a place in which to start fresh — an open territory where limitless ideas are embraced. Shawnee has always been just such a place. Hospitals : Shawnee Mission Health (SMH) is one of the most preferred networks in the Kansas City metropolitan area. Our dedication to improving the health of patients' bodies, minds and spirits is the cornerstone of our existence and the fuel that has carried us forth on a healing journey that spans more than four decades. Shopping : Shopping close to home not only sustains natural resources by reducing the amount of miles and emissions involved in travel; it also helps sustain the local economy. Visit some of the links below to find ways to shop and eat local. Sports : Experience Major League action at Kauffman Stadium, home of the Kansas City Royals. University :University of Missouri Whether you are finishing high school, transferring schools, pursuing a second degree or living an ocean away, we are excited that you've taken the first step in the admission process. Holiday Inn Express & Suites Kansas City West Shawnee Kansas KS Hotels Lodging Accommodations Budget Affordable Motels Cheap Vacation Packages Specials Pet Friendly Weddings Business Travelers Business Meetings Extended Stay Cerner Corporation Hotels by Hallcon Corporation Lenexa, KS ,Hotels by Community America Credit Union Corporate Office Lenexa, KS, Hotels by Genesh Inc. Lenexa, KS.